The iPad Air 2 and iPad mini 3 have gone on sale in Malaysia for a short while now, and those of you who are waiting to see what the telcos have got to offer, Maxis is now selling the two latest tablets from Apple from as low as RM1,689 and RM1,349 respectively. 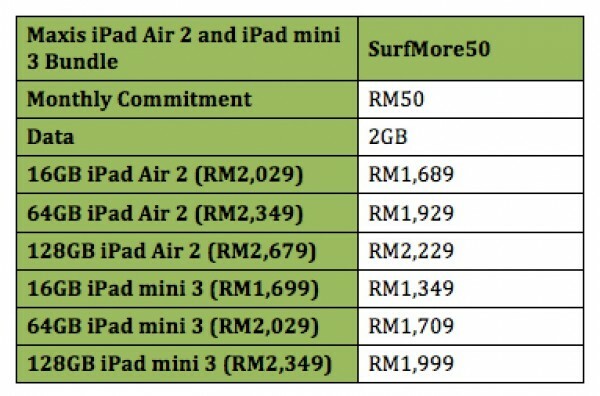 For those of you who think you can make use of LTE from Maxis and get a big data plan for the new iPads, sorry to disappoint, but Maxis is only offering the iPad Air 2 and iPad mini 3 with its SurfMore50 plan, abandoning the SurfMore75 that was previously available as an option to buy the previous generation iPads. SurfMore50 comes with only 2GB of data but of course, if you exceed your quota, you can always purchase more. 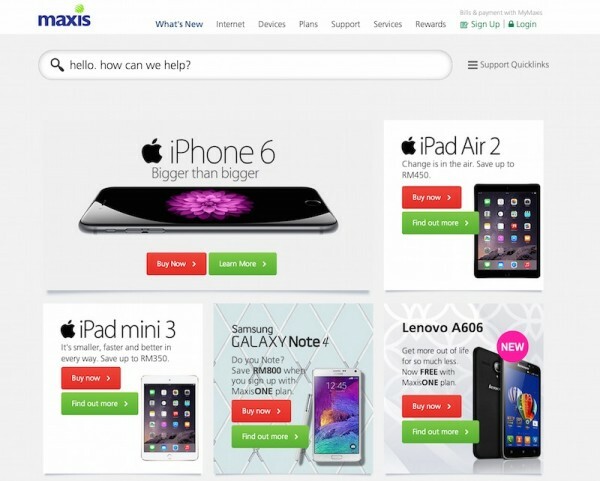 Maxis is offering the Wi-Fi + Cellular versions of the iPad Air 2 and iPad mini 3. The iPad Air 2 and iPad mini 3 quietly popped up in Apple’s online store about two weeks ago but was unavailable for checkout. Few days later, Apple finally started delivery of the tablets to Malaysia. As for over the shelves availability, the new iPads only went on sale in authorised Apple resellers last weekend. Check out our previous posts to find out more about the iPad Air 2 and iPad mini 3, or visit Maxis to find out more about the plans offered for the iPad Air 2 and iPad mini 3.